My mother used to tell me that “Beauty is in the eye of the beholder.” She explained to me at a young age that everyone has something of beauty, whether this beauty was a physical or spiritual. My mother is a firm believer that since we were created in the image of God, we were created in His beauty, in His likeness. 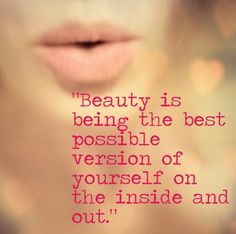 I love this statement because it eliminates the insecurity of “not being” beautiful or pretty enough for others. If I was created in the image of God, like the Bible says- then from the beginning of my time here on the Earth, I was created beautiful. God looks upon me and He sees Himself and all of His beauty, and therefore He calls me beautiful. Beauty is in the eye of the beholder, I am beautiful because God beholds me in His beauty. The desiring of my body does not make me beautiful but the pursuit of my spirit and my mind creates beauty. I am beautiful because I am beheld by God and He sees me as beautiful. God sees me as beautiful. So I encourage you today to see yourself as beautiful. You was created in the image of God, in all of His beauty and no matter what you are beautiful. Your spirit makes you beautiful, not your outwardly countenance. We focus too much on the physical, when the most beautiful parts of ourselves are our spirits. You are beautiful. I don’t care who says you aren’t, I come to tell you that you are because you are beheld by God and He sees His beauty in you! Next Article A Gift Is Just That…A Gift.